Connectors are a collection of instructions that customize the way your email flows to and from your Office 365 organization. Actually, most Office 365 organizations don't need connectors for regular mail flow. This topic describes the mail flow scenarios that require connectors. Enable mail flow between Office 365 and any email server that you have in your on-premises organization (also known as on-premises email servers). Apply security restrictions or controls for to email exchanges between your Office 365 organization and a business partner or service provider. Enable email notifications from printers, devices, or other non-mailbox entities. Avoid graylisting that would otherwise occur because of the large volume of mail that's regularly exchanged between your Office 365 organization and your on-premises email server or partners. Graylisting is a delay tactic that's used to protect email systems from spam. In Office 365, graylisting is done by throttling IPs to limit senders from sending suspiciously large amounts of email. Office 365 responds to these abnormal influxes of mail by returning a temporary non-delivery report error (also known as an NDR or bounce message) in the range 451 4.7.500-699 (ASxxx). For more details on these types of delivery issues, see Fix email delivery issues for error code 451 4.7.500-699 (ASxxx) in Office 365. What happened to inbound and outbound connectors? Nothing. We just don't call them "inbound" and "outbound" anymore (although the PowerShell cmdlet names still contains these terms). If you previously set up inbound and outbound connectors, they will still function in exactly the same way. The process for setting up connectors has changed; instead of using the terms "inbound" and "outbound", we ask you to specify the start and end points that you want to use. The way connectors work in the background is the same as before (inbound means into Office 365; outbound means sent from Office 365). You have a standalone EOP subscription. You have your own on-premises email servers, and you subscribe to EOP only for email protection services for your on-premises mailboxes (you have no mailboxes in Exchange Online). Some of your mailboxes are on your on-premises email servers, and some are in Exchange Online. Before you manually configure connectors, check whether an Exchange hybrid deployment better meets your business needs. All of your mailboxes are in Exchange Online, but you need to send email from sources in your on-premises organization. You don't have your own email servers, but you need to send email from non-mailboxes: printers, fax machines, apps, or other devices. You frequently exchange sensitive information with business partners, and you want to apply security restrictions. You want to use Transport Layer Security (TLS) to encrypt sensitive information or you want to limit the source (IP addresses) for email from the partner domain. If you don't have Exchange Online or EOP and are looking for information about Send connectors and Receive connectors in Exchange 2016 or Exchange 2019, see Connectors. Have you completed an Exchange hybrid deployment? Do I need to set up connectors manually? Exchange 2010 or later Exchange Online Protection Not available Yes. Follow the instructions in Set up connectors to route mail between Office 365 and your own email servers. Exchange 2010 or later Exchange Online No Consider whether an Exchange hybrid deployment will better meet your organization's needs by reviewing the topic that matches your current situation in Exchange Server Hybrid Deployments. If a hybrid deployment is the right option for your organization, use the Hybrid Configuration wizard to integrate Exchange Online with your on-premises Exchange organization. If you don't want a hybrid deployment and you only want connectors that enable mail routing, follow the instructions in Set up connectors to route mail between Office 365 and your own email servers. Exchange 2010 or later Exchange Online Yes No. The Hybrid Configuration wizard creates connectors for you. To view or edit those connectors, go to the Connectors page in the Exchange admin center (EAC), or rerun the Hybrid Configuration wizard. Exchange 2007 or earlier Exchange Online Protection or Exchange Online Not available Yes. 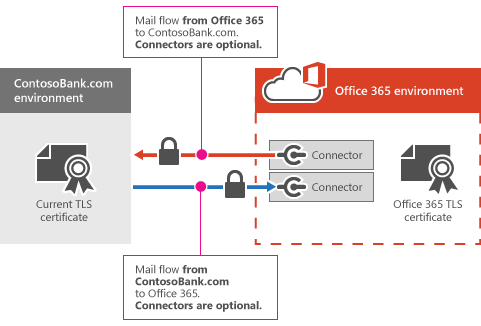 Follow the instructions in Set up connectors to route mail between Office 365 and your own email servers. In limited circumstances, you might have a hybrid configuration with Exchange Server 2007 and Office 365. Check whether connectors are already set up for your organization by going to the Connectors page in the EAC. Non-Microsoft SMTP server Exchange Online Protection or Exchange Online Not available Yes. 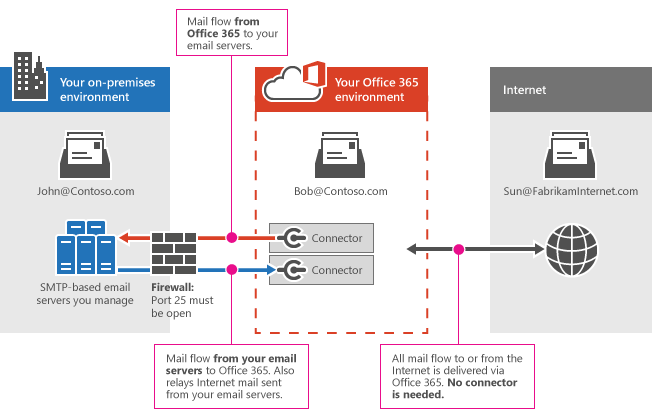 Follow the instructions in Set up connectors to route mail between Office 365 and your own email servers. Connectors enable mail flow in both directions (to Office 365 and from Office 365). You can enable mail flow with any SMTP server (for example, Microsoft Exchange or a third-party email server). The diagram below shows how connectors in Exchange Online or EOP work with your own email servers. When email is sent between John and Sun, connectors are needed. (All internet email is delivered via Office 365). When email is sent between Bob and Sun, no connector is needed. Always confirm that your internet-facing email servers aren't accidentally configured to allow open relay. An open relay allows mail from any source (spammers) to be transparently re-routed through the open relay server. This behavior masks the original source of the messages, and makes it look like the mail originated from the open relay server. What if I've already run the Hybrid Configuration Wizard? If you've already run the Hybrid Configuration wizard, the required connectors are already configured for you. You can view your hybrid connectors on the Connectors page in the EAC. You can view, troubleshoot, and update these connectors using the procedures described in Set up connectors to route mail between Office 365 and your own email servers, or you can re-run the Hybrid Configuration wizard to make changes. You can create connectors to add additional security restrictions for email sent between Office 365 and a partner organization. A partner can be an organization you do business with, such as a bank. It can also be a cloud email service provider that provides services such as archiving, antispam, and so on. You can create a partner connector that defines boundaries and restrictions for email sent to or received from your partners, including scoping the connector to receive email from specific IP addresses, or requiring TLS encryption. The diagram below shows an example where ContosoBank.com is a business partner that you share financial details with via email. Because you are sharing financial information, you want to protect the integrity of the mail flow between your businesses. Connectors with TLS encryption enable a secure and trusted channel for communicating with ContosoBank.com. In this example, two connectors are created in Office 365. TLS is required for mail flow in both directions, so ContosoBank.com must have a valid encryption certificate. A certificate from a commercial certification authority (CA)that's automatically trusted by both parties is recommended. When you create a connector, you can also specify the domain or IP address ranges that your partner sends mail from. If email messages don't meet the security conditions that you set on the connector, the message will be rejected. For more information about creating connectors to exchange secure email with a partner organization, see Set up connectors for secure mail flow with a partner organization. This scenario applies only to organizations that have all their mailboxes in Exchange Online (no on-premises email servers) and allows a program or a device, such as a printer, to send email. For example, if you want a printer to send notifications when a print job is ready, or you want your scanner to email documents, you can use this option to send mail through Office 365 (but there are other options that don't require connectors). For details, see How to Allow a Multi-function Device or Application to Send E-mail through Office 365 Using SMTP. How do I set up connectors? Before you set up a connector, you need to configure the accepted domains for Office 365. For more information, see Manage accepted domains in Exchange Online. What happens when I have multiple connectors for the same scenario?